on 50 & 100ball bags! 100 AAA Nike Mojo Used Golf Balls NOW ON CLEARANCE! Welcome to AAA Used Golf Balls.com! Used golf balls are our specialty at AAAUsedGolfBalls.com. Matter of fact it is all AAAUsedGolfBalls.com does. Titleist, Callaway, Nike, Pinnacle and every other brand we provide in every condition... it's your choice. When you buy used golf balls you have a greater choice of savings when you decide between like new discount golf balls (AAA), good playable golf balls (AA), practice golf balls, or the ever popular hit away golf balls (aka, one hitters, our 18 cent ball). Be assured that at AAAUsedGolfBalls.com quality control is top notch. All our used golf balls are hand graded into our 4 grades to fit the need of every golfer. Our AAA grade will play like a new golf ball without the new ball price. Our AA grade of golf balls is an excellent combination between playability and substantial savings, as you may find a minor blemish or player marks on the ball, but nothing to hinder playablility. If you are a beginner golfer looking for cheap golf balls or if you are simply looking to get some great used golf balls to practice with, our practice grade is a great value. They say that practice pays off, after all! And of course we have our almost famous 16 cent golf balls as our hit aways, or one hitters... the ball you hit into the woods, field or wherever you have the space. These have proven to be a popular gift item... seriously! AAA Used Golf Balls is pleased that our customers have come to expect excellent customer support from us. No matter if it's gift notes, shipping questions or order concerns we thrive on providing you with the customer service you deserve! 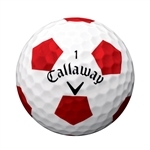 I ordered 4 dozen Callaway golf balls for a very good price. They were in mint condition, could not tell that they were used. Very pleased with the whole transaction. The golf balls were as described, in very good condition. We got them in 3 days. Great service. Such an easy transaction, superfast shipping. Exceeded my expectation! Balls arrived quickly, well-packaged and selected as to my preference. This is my third purchase and each has been above average in these aspects.